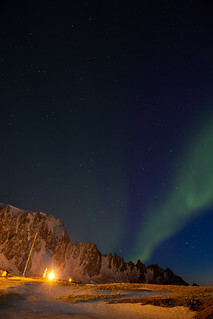 An aurora danced across the night sky prior to the launch of the AZURE sounding rockets at the Andøya Space Center in Norway. During their flight on April 5, these two sounding rockets deployed gas tracers — made of substances similar to those in fireworks — to create colorful clouds that allow researchers to track the flow of neutral and charged particles with the auroral wind. This helps scientists better understand the exchange of energy within an aurora.